Since pre-historic times, the textiles used in the creation of baskets, clothing, and shelter have serviced all of one's external needs. Yet, despite this established pattern of practice, our affinity for textiles remains a mystery--the type that one only grasps haptically. Literally, the fibers that bind one to her environment, the patterning of textiles illustrate the genesis of all geometries stellar and terrestrial. Like textiles, the mysterious patterns of hyperbolic geometry are ever present yet not fully understood. Geometry of the hyperbolic plane is endemic in everything from the structure of proteins to Einstein's General Theory of Relativity and Curved Hyperspace. This geometry is also present in the formation of coral reefs, whose large living architecture of calcium carbonate laid down by living organisms over thousands of years, are home to the most productive of all ecosystems. Are based on crocheted textile patterns that are also endemic in nature. Utilize unconventional materials such as bioplastic, jute, paper, and dirt, whose deterioration fosters the growth of a beneficial ecosystem. Foster the growth of community-crafted spaces that inspire one's sense of wonder and imagination, while empowering one with knowledge about the environment she lives in. For details about the pieces and experiments, click on the image below. My Work In Progress installation at the Textile Arts Center in Manhattan. On view from 1-30 September 2017. From clothes to upholstery, rooms and large constructions, textiles are literally the ties that bind one to her/his environment. Resiliency of this environment is furthered through the advances in geotextile designs, which contribute to the sustainability of the world's shorelines. However, many of these textiles are made of materials that may take a long time to degrade, and may be harmful to local ecosystems in the interim. I am interested in the ways in which knit and crochet techniques of textiles can be used to create generative habitats. 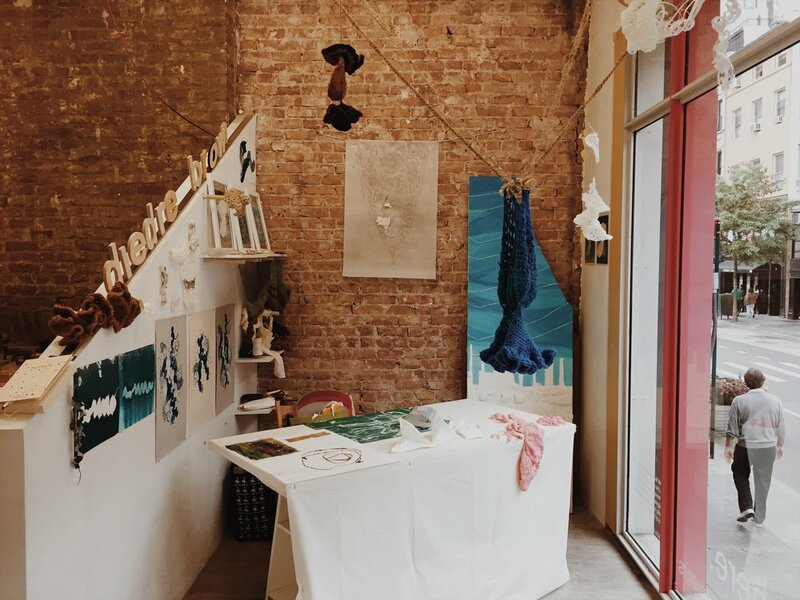 Through the use of crochet, illustration, printmaking, and a variety of biomaterials, I experiment with hyperbolic geometries and design pieces that can serve as a method for improving these liminal habitats. 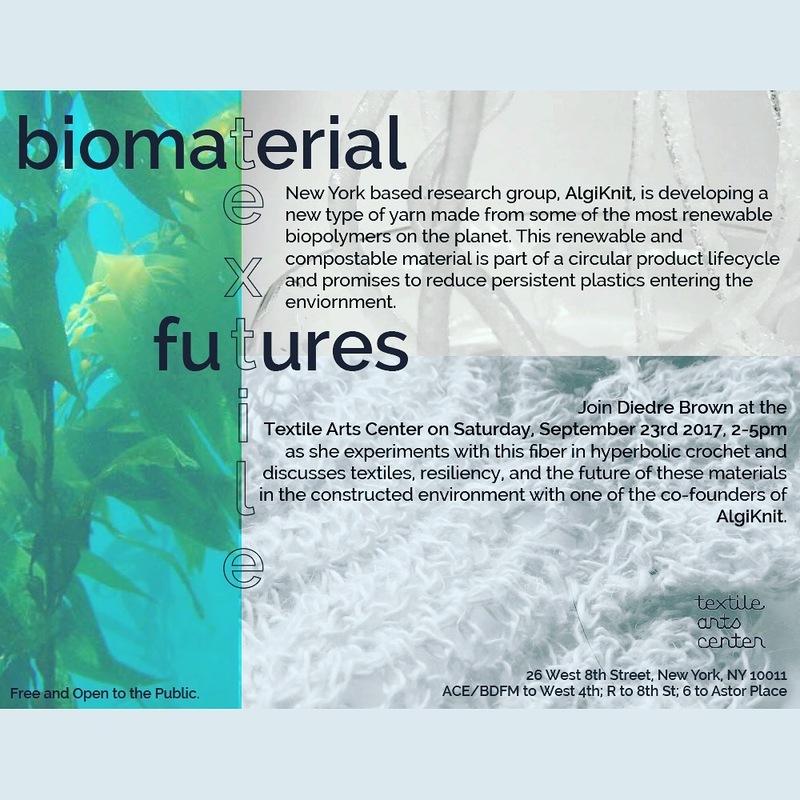 On Saturday, 23 September 2017, my guest 2017 National Geographic Chasing Genius award winners, AlgiKnit, and I discussed biomaterials, textiles, resiliency, and crocheting AlgiKnit hyperbolically. The final works produced and views of my studio space during my residency at the Textile Arts Center.